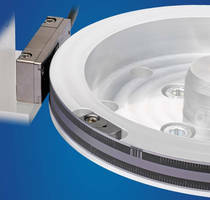 Modular Encoder enables angle measurement on large axes. MSR 40 rotary position feedback system targets machine designers who want to measure angle on larger rotary axes. Suited for machines requiring motion feedback for full 360Â° or segment thereof, optical kit style encoder provides 200 micron grating pitch on steel tape that can be applied 3 ways to axis of motion. Available diameters range from 150–1,150 mm, and reader head is available with analog 1 V peak to peak interface as well as digital TTL interface with up to 100X interpolation. Schaumburg, IL — RSF Elektronik unveils the MSR 40 modular rotary position feedback system to machine designers who want a quick way to measure angle on larger rotary axes. Common applications for the MSR 40 include medical technology, general automation, textiles, and auxiliary axes in machine tool and metrology. The MSR 40 optical kit style encoder provides a 200 micron grating pitch on a steel tape that has three ways of being applied to the axis of motion. The MSR 40 is ideally suited for machines which require motion feedback for a full 360 degrees or a segment thereof. The MSR 40 is available with a minimum diameter of 150mm to a maximum of 1150mm, however larger diameter versions are available upon request. The same reader head can be used for all the various diameters offered, and is available with analog 1 Volt peak to peak interface as well as digital TTL interface with up to one hundred times interpolation. All measuring tape versions of this encoder have a +/- 30 micron per meter accuracy associated with the circumference of tape. The MOR version tape requires a small pocket to be milled from the axis in order to accommodate a clamping mechanism which ensures accuracy over the joint of the measuring tape ends. The MER version has small plastic tubes on the back of the measuring tape as a supporting structure and the measuring tape can be screwed together to complete a full 360 measurement. This version is very quickly mounted to the axis as a benefit because of the tube backed measuring tape. This version is rated for a lower dynamic performance and rigidity as a consequence of very simple mounting. The MKS version of tape is a segment with an adhesive and is pre bent to the diameter to ensure long lasting quality of measurement. RSF Elektronik encoders are available in North America through parent company HEIDENHAIN Corporation, and commonly found in the metrology, machine tool, and semiconductor industries. RSF Elektronik can be accessed directly via the web site at www.rsf.at. The North American contact for RSF products is Kevin Kaufenberg (at 847-490-0387 or kkaufenberg@heidenhain.com) in the HEIDENHAIN Corporation offices at 333 E. State Parkway, Schaumburg, IL 60173.